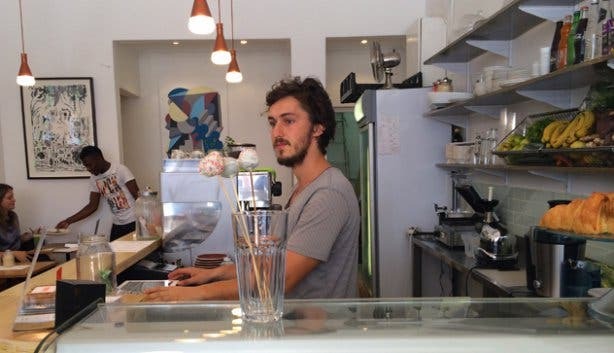 Naturally, Robbi Gorelick and Cian van der Vyver, the brains behind Molten Toffee café on Kloof Street, are fanatical about a good cup of joe. But what the founders and friends are equally passionate about is people, and their new venture is very much based on the belief that the two – coffee and community – are intimately entangled. And so, with Molten Toffee (the name is Cockney rhyming slang for ‘coffee’), the duo are not trying to reinvent the wheel; they’re simply aspiring to offer CBD worker bees and java junkies another meet-up hub. 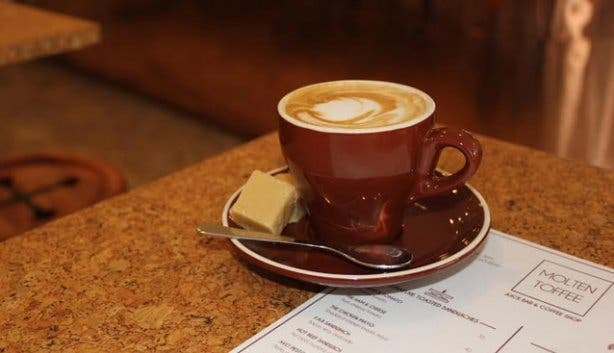 Their aim is to create an environment that’s conducive to good conversation and the sharing of great ideas, a Cheers-like spot where everybody knows not only your name, but how many sugars you’d like in your latte. Of course, the focus on togetherness doesn’t mean that the owners neglect the quality of the coffee though. Rather, they pride themselves on making what Robbi refers to as “a really fantastic cup” of Deluxe Coffeeworks joe with just the right balance of body and flavour. Their commitment to the hot beverage is also reflected in the trendy design of the space, which takes its cue from the rich, syrupy colours of the drink in question – a copper counter takes pride of place in the centre of the shop, chestnut leather banquette seating runs down one wall, copper lights dangle from the ceiling and caramel-coloured button stools huddle around small cork-topped tables, both inside and outside on the pavement. In the spirit of community, the café also sells a number of products crafted by friends and acquaintances, including all the artworks displayed on the walls, olive oil by Leon Morland (he designed much of the décor too) and a range of pastries, raw treats and savoury delights made on a daily basis by Cian’s chef sister. The latter selection of eats is displayed in a deli fridge in the front of the eatery, and on any given day, visitors can expect anything from cake pops and peanut butter cups to roast vegetable quiche and chia seed pudding with strawberries. 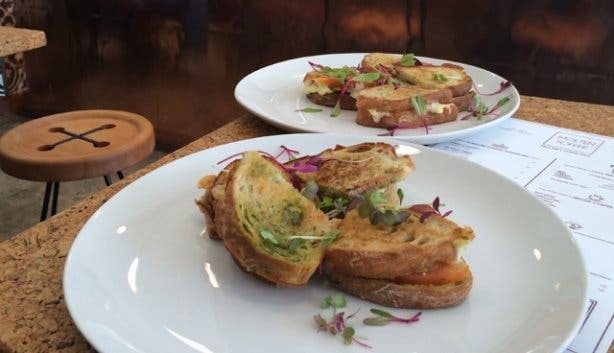 In addition, there are always other more staple breakfast and lunch options available too, such as crispy croissants, bacon and egg rolls, muesli and yoghurt cups, toasted sandwiches and salad bowls. The bites go down a treat with a cup of java or any of Molten Toffee’s freshly pressed fruit or vegetable juices, which can be made on site from a mix of carrots, apples, beetroot, kale, ginger and more for those looking for something a little cooler and fresher than coffee. Speaking of cool and fresh, the eatery’s music selection is noteworthy too. Cian and Robbi are ardent fans of good beats and plan to grow their playlist around their own tastes and those of all their regulars – soon guests will even be able to stream songs off their personal devices via AirPlay. 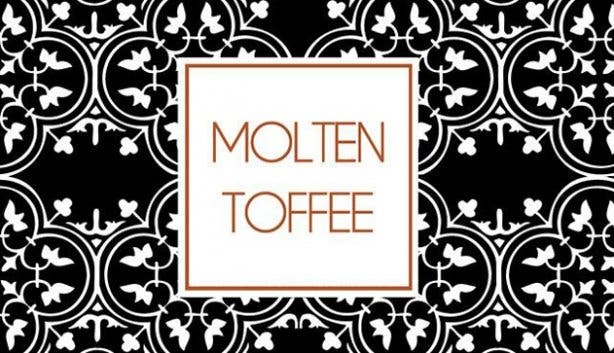 So, at the end of the day, the soundscape at Molten Toffee will be a reflection of the crowd that hangs out here, as will essentially everything about this hip, people-centred haunt. Tip: The café offers a 10% discount to all MyCiTi bus card holders, so while you’re waiting for your transport just outside the shop’s front door (there’s a station right there), why not pop in for a quick bargain cuppa and a gratis web surfing session (the eatery offers unlimited free Wi-fi). 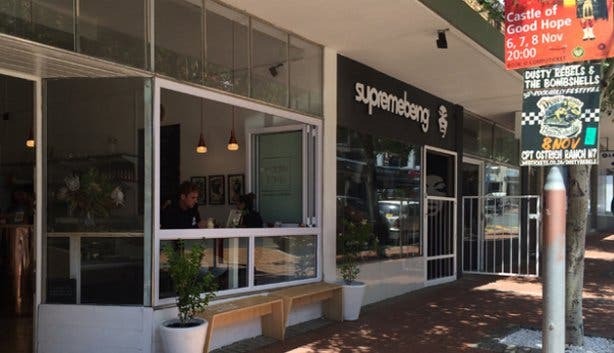 The Bill: Prices are pretty competitive: coffee goes for between R15 and R20, a cup of freshly pressed juice rings in at R30, croissants start at R16, toasted sandwiches range from R35 to R55 and salads sit between R35 and R45. 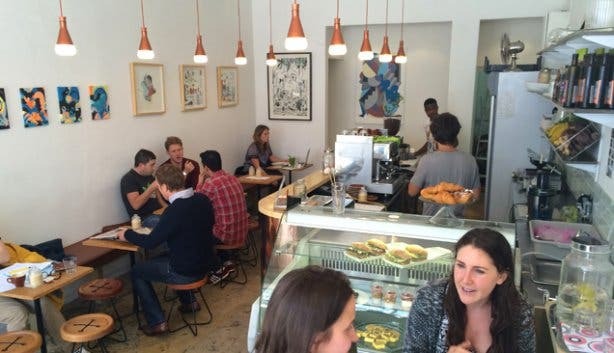 Read about other hot coffee shops in Cape Town in the dedicated café section of our site.